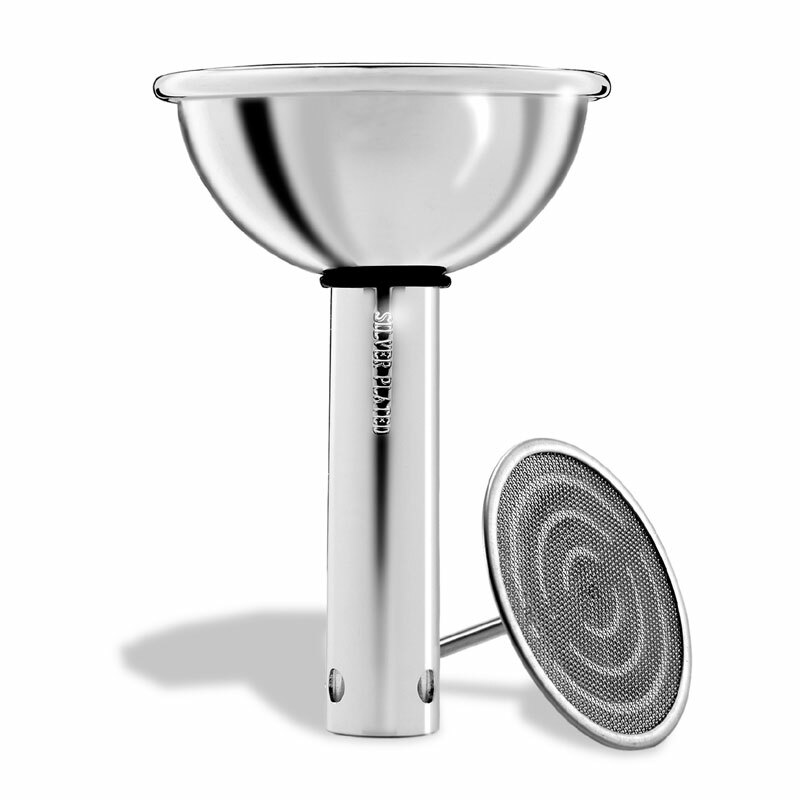 The wine aerator is made of silver-plated brass and is accompanied by a filter which will prevent loose bits of cork and other sediment from reaching your decanter or glass. Pouring wine through an aerator allows it to breathe, giving it exposure to the surrounding air. This aerator has little holes at its base so the wine is forced through them and this pushes the liquid to the side of the glass decanter or carafe, exposing the wine to an increased surface area, allowing more air to come into contact with the wine. Made of silver-plated brass, the wine aerator with filter ensures the complete volatilisation of the sulphurous anhydride when the wine simply touches the internal wall of the funnel. This allows for a cleaner and more accurate olfactory test. 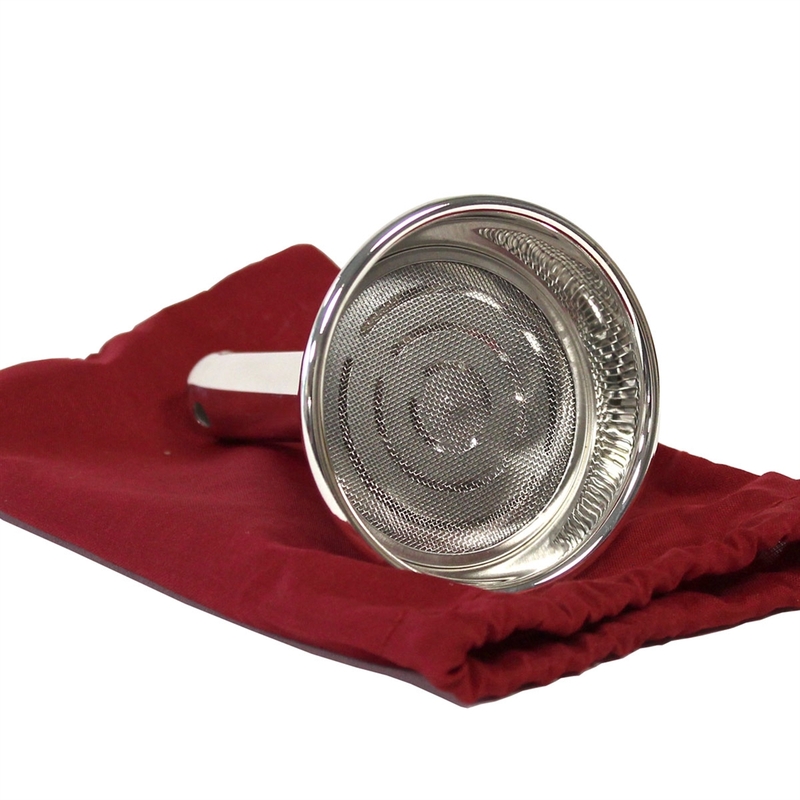 The bottom of the funnel is closed so that the wine is forced out through three small holes around the base, an effect which is impressive and, above all, highly beneficial. In fact, the three small rivulets of wine create a an unusual pattern of wine running down the internal walls of the decanter which, besides being spectacular, allows an extraordinary level of oxygenation that magnifies the fragrances and the aromas of the wine. It slows the flow of the wine, thus allowing greater time for the oxygenation of the wine to take place. 11911, 11921, 113784, 113786, 110255, 110257, 112909, 113745, 113747, 11961, 11971, 1440/13, 1440/14, 1440/26, 1480/13, 236/13, 2400/13, 2400/14, 3440/36, 400-00-58, 400-00-59, 400-00-62, 400-00-63, 40158/70, 40158/80, 402-00-59, 403-00-59, 4123, 4178, 712.15, 719/1.5L, 737/3, 749.15, 755/1.5. Fantastic filter! Works well, and it’s design allows for easy cleaning. I bought this for my own use, but I’ll probably buy again, as a gift. Looks good but more importantly does what it's meant to. Haven't had a chance to try out the sediment filter yet but I'm sure it's up to the job. It looks ideal, as it's a present I won't know that it does the intended job until Christmas.